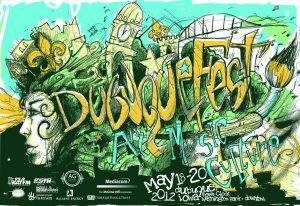 Get set for this year’s DubuqueFest Fine Arts Festival on May 18-20, 2012 in Washington Park and the Town Clock Plaza. The oldest continuously running festival in the city, DubuqueFest takes place the third weekend in May in the heart of historic Dubuque, Iowa. Sponsored by the Dubuque County Fine Arts Society, the event features a Fine Art Fair in Washington Park with work for sale by exhibiting artists including pottery, wood carving, Chinese brush painting, custom leatherwork, jewelry, native American beadwork, watercolors and more. Enjoy children’s activities and free musical performances on Washington Park’s Gazebo stage. A highlight of this year’s celebration is a community collaborative painting project with artist Keith Huie. Art fair exhibitors will be honored with an evening artists’ reception at the Dubuque Museum of Art. Click here for the complete Arts Schedule. Great music is also a feature of the annual DubuqueFest celebration, and throughout the whole weekend, Dubuque’s Town Clock Plaza will resound with folk, blues, rock and jazz in a slate of free performances. Madison based Pioneer will kick off the festival on Friday evening, leading up to Friday’s headliner, indie piano blues phenomenon Andy Frasco. Saturday’s long list of entertainment includes Chicago post-modern jazz rock outfit Stirrup, with other free performances not to be missed. Two stages at the Town Clock Plaza will fill the heart of Dubuque with nonstop fun and music! Click here for a complete Music Schedule. Also during DubuqueFest, the Old House Enthusiasts will hold their annual old home tour, featuring four homes in the Broadway St. area plus the newly restored White House at Four Mounds. Click here for the tour brochure. Another festival feature is a Dubuque Area Writers Guild release and reading. Live art and pottery demonstrations, food and refreshments, and fun for the entire family will fill downtown Dubuque the entire weekend of May 18-20. To stay current on the latest DubuqueFest news as it happens, “like” DubuqueFest on Facebook. You can also follow the festival on Twitter. Be sure to bookmark this website and stop back for features and the most current schedule of events, music, and art!